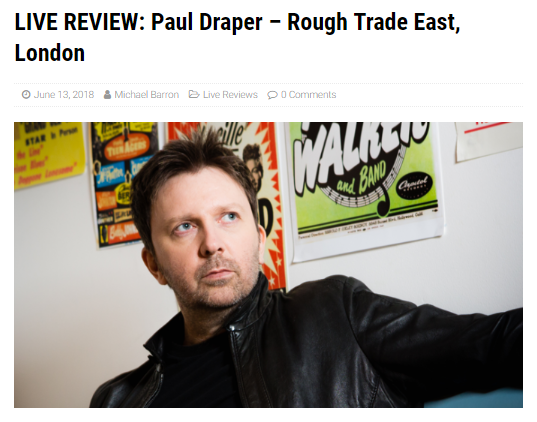 PAUL DRAPER ‘SUPERB SINGER-SONGWRITER’ … XSNOIZE REVIEW ROUGH TRADE EAST ACOUSTIC GIG BY FORMER MANSUN FRONTMAN. “Paul announced he would begin with The Chad Who Loved Me. An appropriate choice, after all, Attack of the Grey Lantern opens with this haunting, charming anthemic classic, the “antithesis to what fans had previously heard or expected from Mansun and other artists categorised in the Britpop genre”. One wondered how Paul would captivate the complex cacophony of the production of this track with the absence of the strings. The strings were missing, but the soul of this track wasn’t. Paul vocals were powerful, ethereal and still peaking twenty-one years later. His passion and enthusiasm for this song as well as his debut LP had not waned. As well as The Chad who loved Me, Paul also wowed with Disgusting and played out with Wide Open Space. The soul, warmth, perplexity, elated ecstasy and bittersweetness of these Mansun greats and classics shone through. Joyful, loud, out of key singing from the bowled over audience confirmed that Attack of the Grey Lantern has stood the test of time and can still reach out and enlighten. Alongside Attack of the Grey Lantern classics, Paul played material off his debut album, Spooky Action, as well as B-side, The Silence Is Deafening, from his debut solo EP. Spooky Action, not even in its first year, has won the hearts, souls and minds of Mansunites; they were singing along to and celebrating the new material Draper played. Friends Make the Worst Enemies and Things People Want to give fans the festival high they found when they first listened to Attack of the Grey Lantern. You can read the whole XSNOIZE review HERE .